Graham Turner has told the Worcester News that he feels the Bulls could be higher up League Two. "After three league matches, and given our Carling Cup results, our start, while quite acceptable, could have been a lot better," said Turner. "We should have taken all three points last Saturday and would have but for some good goalkeeping, missed opportunities and bizarre refereeing. "We might have been third in the table at the moment. "Everybody who has watched us play must have appreciated the quality in the side and that, as we get a better understanding, we will improve." Turner mentioned how other sides were performing. "Chester have had an excellent start and it does not surprise me to see Darlington up there. We have tipped them for one of the promotion spots, along with the likes of Peterborough and Shrewsbury." Here's another view of the Watson issue. I have read Bulls News this morning - and I am aware of GT's letter to you which does not make good reading. BUT and this is the crux of the matter. a) Bulls News to retain any journalistic credibility should hold back from editorial on this issue ( by all means print the things other blogs or press are saying ) your own dispute with GT I dont think should be introduced into the situation. c) The reinstatement of Martin is essential - but the olive branch has been given - lets not waste that. At present the club has stated he has not got a life ban. d) The meeting will give you WHAT you asked for in your letter ( and public ) this is a massive opportunity for you to ask some questions of GT and for fans about sensitive issues and to get his honest and heartfelt replies in person. This is a massive chance for you. e) The conditions set by GT are perfectly reasonable. Any press briefing asks for those attending to register and to announce who they are and what paper etc before speaking. Surely this is the professional PR approach that everyone has been asking for. GT is tightening up his act - possibly he is being briefed by a PR over the recent events which led to him being in the national press against Karren Brady - he has the contacts. The team will lose on the pitch if fans and the management dont unite over this - we are a small club which survives because of people like you and Martin doing things for nothing. I ask you to read through Bulls News and try to help the situation. I know it is hard for you guys because of the recent history. But I also know that you love this club very much. Put that first when editing your site and choosing what you say before anything else. I hope that this can all be resolved I really do. Also I do detect that the majority of fans like the forum as it is - not the new style..........I cant understand again why it should be closed down if freedom of speech is to be maintained. That means all of us who contribute are being "banned" in a sense from something we enjoy and in general is positive about the club. I have carried out my own "boycott" which is to remain off any HUFC forum until a ) Martin is reinstated and b) the issues underlying all of this are resolved. I will never boycott the club in any way. Hereford United have confirmed the signings of two more players. Youth team product Craig Jones has signed non-contract terms, while Marvin McCoy has signed a one month contract. Former Watford Academy player McCoy, a full back, played in their reserve side with Theo Robinson and more recently had a trial with Luton Town. Midfielder Jones, formerly on the books at Cardiff, has been a regular feature for the Bulls reserves and has trained with the first team. The current transfer window closes at midnight tonight for all permanent transfers and long term loans. There has been no indication that Hereford United will move to bring anyone into the club but an announcement may be made of a longer deal for Michael Ingham, the goalkeeper who initially agreed a one month deal. As is usual before a deadline some clubs will be doing deals late into the evening and details of any deals may not be made public for a day or two. Meanwhile Phil Dowd from Staffordshire will be in charge of tomorrow's game at the Racecourse. UPDATE 2.30pm. The Hereford United Official Website has just confirmed that Ingham has agreed a season long deal. The meeting proposed by Graham Turner to discuss matters that have arisen from the Martin Watson ban has been arranged for 7pm on Tuesday evening at Legends. Keith Dodd, the chairman of HUISA, has confirmed that the meeting requires both full name and pen name of supporters attending. This article appeared on a blog written by Gary Andrews, a broadcast journalist and Exeter supporter. What I'm about to say probably won't please Hereford United FC. I'm not a big fan of their ground. The turnstiles are so narrow that a 10 and a half stoner such as myself has to squeeze through, the toilets are just plain horrible, and some bright spark forgot to attach the roof to the back wall in the away area meaning the back steps get soaked every time it rains. I'm hoping that these negative comments from an occasional sports journalist, published on an internet blog, free to read by anyone, won't result in a lifetime ban preventing me from visiting should Exeter play the Bulls, or even if I happen to be passing Edgar Street in the not-too-distant future and decide to catch a match. Martin Watson isn't so lucky. This lifelong Hereford fan, and season-ticket holder from 1994, is currently banned for life from the ground. His crime? To run an unofficial internet forum, not a million miles away from hundreds of other football fan sites. Last Saturday, after Hereford's match at home to Rochdale, one poster made a comment questioning the official attendence. Hereford's manager/chairman Graham Turner felt the post the be libelous and rang Watson, asking him to remove the post. And then banned Watson from the ground for life. Turner later posted a statement on Hereford's official site (see below). More of that in a sec. Now, having not seen the offending post, let's give Turner the benefit of the doubt and say it was libelous to whomever. In which case, he was well within his rights, under current English law , to inform Watson of the comments left on the site and Watson seems to have removed them as soon as he was informed. All well and good, problem solved, so why on earth Turner then felt the need to ban Watson is baffling, to say the least. Unsurprisingly, Watson has shut down the forum off the back of it. When you reach a stage like that, something you do for the love of your club just isn't worth the hassle. "This weekend an unfounded and libellous statement was posted after our match against Rochdale, it remained on the site for 3 days before our request to have it removed was carried out. I do not accept that for three days the organisers did not know of its existence or its implications. At no time have I ever asked for it to be closed." Now, a couple of points here. Firstly, it was a bank holiday when the comment was made. I don't know how many moderators the site has (3 by the looks of things) but with family commitments, holidays, etc there's a good chance 3 days could pass before anybody was able to properly go through the site and look at the discussion boards. Also, it took Turner three days to a) notice the comment and b) do anything about it. Its not unreasonable to assume the forum would take the same amount of time. The fact Watson removed the post once informed suggests he'd have taken it down earlier if he knew about it. Secondly, as an ex-football forum moderator myself, I know how difficult it can be to keep track of discussions, especially after matches where there's often thousands of comments in the space of a couple of hours meaning the odd comment can be easy to miss. Again, when brought to my attention, they'd usually be dealt with. But getting a text on a Saturday night when I've had a few doesn't mean its easy for me to drop everything and rush back to a computer screen. Ditto with this blog and the previous one, Coffee and PC. On the rare occasions I got asked to remove things, I'd usually edit them out when I was near a computer. On occasions, like the time I was off on the top of Dartmoor, this isn't always possible immediately. Turner's argument isn't black and white, that's for sure. And he may not have asked to shut the forum, but I don't think anybody can be surprised at Watson's subsequent action. "I cannot therefore sit back and do nothing about the outrageous, unfounded and libellous comment that came onto this web site. In my view the organisers must take responsibility and be accountable for what is posted. They provide the vehicle for the comment so therefore must take responsibility to have it monitored." Again, Turner isn't sit back and do nothing. He complained. The organisers took responsibility and removed the post. What more does he want and, short of closing the forum, or Turner launching a legal action, what more could be done? What worries me is Turner's creating a dangerous precedent. Lets now assume, for the moment, the statement wasn't libelous and Turner just happened to disagree with this and other comments made. After all, it's not unheard of for football bosses to throw a bit of a sulk with broadcasters, so its only to be expected with the internet. Whatever the post on the forum said, there's a good chance a football fan will be saying exactly the same thing in front of a dozen or so down the pub. Turner may disagree with it. Would he ask the pub to ban the drinker? Much as the post-match views of football fans often drive me to distraction , they've got as much right to voice their opinion as anyone else. The manager probably will disagree he was crap and got his tactics wrong. The board will probably disagree they're not investing in the team. Such is the lot of football, and will be forever more. But if you banned every fan who posted something critical or querying about the club, the terraces would soon be pretty empty. This episode reminds me of two closer to home . Firstly at Torquay United last season, where colourful then-chairman Chris Roberts, during his rather brief stint, had a very public spat with the Supporters' Trust over a whole host of things. Roberts claimed the leading members of the Trust were not true supporters and just in it to cause trouble, despite them being among the few who could be bothered to get off their arse and try and save the South Devon club. Then, a few years earlier, the year-long reign of John Russell and Mike Lewis in the boardroom of Exeter City. A few months into their tenure, and a few members of the unofficial online fans forum, Exeweb, started highlighting a few odd things, and suggested all was not what it seemed with the twosome. Without these few individuals using the power of the net, I'm really not sure how far the anti-Russell and Lewis campaign would have got. Given their fondness for banning a few dissenters during matchdays, I'm surprised Steve Morris, who runs Exeweb, didn’t get a ban . I'm in no way comparing Turner, or Roberts, to the gruesome twosome, but it illustrates the point that online forums play a massive part in fan support nowadays and often are forces for good rather than evil. Yes, there's a lot of very idiotic comments directed against the team, largely letting off steam behind a computer post-defeat. But the forums also help build a sense of camaraderie, get new fans involved, exiled fans up to date, and generally contribute to the community of a club. I don't doubt I wouldn't have kept up my interest in City to such a high degree when I was living in Cardiff if it wasn't for Exeweb. The petition to get Martin Watson's ban rescinded is here (scroll down to a previous artice to sign). If you care about football, free-speech, or both, I hope you'll put your name to it. And while I may be risking an Edgar Street ban for this post (assuming Graham Turner actually reads this), at least it means I won't have to experience the toilets or the leaky roof again. If the forum was in print format, it would have been a case of publish and be damned (although the journalist, if they'd been worth their salt, would have, at the very least, carried a response). Although, a forum isn't a newspaper, so… oh cripes, I can see where I'm going here. Right, let's put ALL that to one side as fascinating subsidiary issues and get back to the point in hand, otherwise I'll be here all night. Ok? Happy? Good. Have you ever tried to listen to the 5pm phone-ins on Talksport and 5Live? I mean really listen? You might as well play the entire works of Leonard Cohen. It'd be more cheerful. Yes, admit it. You’ve all be waiting for me to talk about Exeter City. I'm reminded of a quote from David Blunkett, on passing clauses in the Serious Organised Crime and Police Act 2005 to curtail Brian Haw's protest in Parliament Square: "It is a sledgehammer to crack a nut, but he is a nut." Whilst tomorrow's fixture with Hereford United goes ahead as planned, Wrexham have called off their next two fixtures as several of their players are on International duty. "It’s unfortunate, but if we were to lose anyone else to injury in the Hereford game we might have left ourselves very short of options, to say nothing of picking up knocks in training," said manager Brian Carey. Meanwhile Graham Turner has told BBC Hereford and Worcester that he has a full squad for tomorrow's game and is hopeful his players can repeat the second-half performance at Birmingham earlier this week. "We matched a very good Birmingham side, and if their keeper hadn't pulled of some fine saves, we would have gone to extra-time at least," said Turner. "We need to believe we can repeat that sort of form, get our passing game going, and if we do we can be challenging in the Second Division. "I'm delighted with the way the players have worked to come together as a team, and even though it is early in the season, I feel we can make a challenge for top places this season." Whether the meeting will go ahead with more than a few supporters is questionable at present unless the conditions imposed by Turner and also repeated by Keith Dodds, the chairman of HUISA who is set to chair any meeting, are dropped. Anyone who has ever written anything which could be taken as being critical of the club may be wary of attending. And from what Turner has said they are the very people he wants to meet. In any case some supporters have expressed the opinion that unless the ban on Martin Watson is totally lifted before any meeting they will boycott it. Turner's request for a meeting contrasts with his attitude to Bulls News recently. We asked for a meeting with him back in June. This was his reply. Thank you for your E-mail. We shall not be taking up your invitation to discuss sponsorship. Bulls News is a vehicle for all the negative things surrounding a Football Club, particulary underminding our efforts to be successful. It is of course everyones right to voice an opinion but the problems some of the contributers cause should not be underestimated. We would therefore be hypocritical , given our views of your site, if we accepted your offer. Could I also take the opportunity to warn you that should anything further be placed on the site that is personal or libelous we would not hesitate to take Legal action against you. We then asked him to substantiate his claims. I have to say I'm at a loss to comprehend the last sentence of your e-mail. have been published on Bulls News? would ask you to substantiate your claims. We are still awaiting a reply from Mr Turner. Keith Dodd was interviewed by BBC Hereford and Worcester this morning. The HUISA chairman was asked about his view of the Martin Watson life-ban from Edgar Street. Dodd started by saying he would have preferred to be talking about the positive things that are happening. "I understand Graham's (Turner) reaction at the time. "I know the acquisations. They were certainly scandalous, libelous and everything else. Not put on by Martin Watson but put on by someone (else). I would have reacted in the same way." Asked whether forums should go Dodd didn't answer the question but moved on to talking about meetings with Graham Turner. "We have liason mettings, fans forums, and certainly Graham doesn't shun any questions. These people can come along and have their say at the time. "We are arranging a meeting next week with Graham and Joan and we are going to have it like a forum in the Legends bar and I will chair it. "And anyone who wants to come along from this forum can have their say provided they sign it under their own name and ask questions properly and sensibly with no abusive language or comments like that. And we will get this sorted out. "And I understand that Martin has not been banned for life. I've been assured that by the club and we will do everything to sort this out." BBC Hereford and Worcester will carry another item on the Martin Watson ban tomorrow morning after 7.30am. Meanwhile reaction to Graham Turner's statement on the Official Site and interview on BBC Hereford and Worcester doesn't appear to have 'cleared the air'. Several supporters are talking of mounting a protest against Turner's actions at the next home game when Macclesfield are the visitors. Finally this evening the Martin Watson petition now has over a thousand signatures. Graham Turner has failed to clarify whether he has banned Martin Watson from Hereford United for life. In an item broadcast on BBC Hereford and Worcester Turner repeated much of what he had said in a club statement earlier today. He was then asked about the ban on Watson. "I think we talked about a ban. I don't know where that ban for life has come from. I had a conversation and we do tend to fire from the hip in football, I had a conversation where I told him we didn't want supporters of his nature about the place. A ban might have been mentioned but there was certainly no indication of that," said Turner. "I think it's been one of those situations where the sympathy vote has gone out but the sympathy for me lies with my staff and that is something I will back to the hilt." Asked by the interviewer, Keith Gooden, if Watson was banned. "There was no mention of a ban for life," said Turner. Gooden then spoke with Malcolm Clarke from the Football Supporters Federation. "I think I just heard Graham (Turner) saying that Martin wasn't banned. If that's so I'm very pleased because that will avoid Hereford United getting a reputation nationally, " said Clarke. Gooden then tried to clarify what Turner had said about the ban. "Can I just clarify that Martin Watson is not banned. I think he's gone." It seems Turner had left. Watson was then asked for his reaction. "I like to have some clarification from him to see what the situation actually is." Hereford United travel to the Racecourse on Saturday for their next League Two fixture and manager Graham Turner is well aware that Wrexham are a more settled club than they were last season and thinks they will be very different opposition. "They've put some fairly big money out over the close season to strengthen their squad," he told BBC Hereford and Worcester. "They had a flirtation with relegation last season and I think from that sort of scare they have invested heavily." BBC Hereford and Worcester are to broadcast an item on Graham Turner's life-long ban on Martin Watson in the Drivetime show after 5pm this evening. Halifax Town are to face a winding up petition over more than £100,000 in unpaid taxes. "The Club is fully aware of the winding up petition and has the matter in hand. The Club requests that all fans and friends, including shareholders, former Directors and supporters organisations get fully behind the Club, Manager, Players and Staff as the takeover by the Consortium enters its finals stages. "It is the Clubs intention to ensure this takeover is completed prior to the date of the winding up petition. Subject to completion of the deal and a 75% shareholding being achieved, funds have been secured that would allow immediate settlement of the monies owed to the Crown." Former Hereford United goalkeeper Matt Baker has retired from football due to a knee injury sustained at Macclesfield recently. Meanwhile, Stevenage Borough have completed the signing of winger Alastair John on a free-transfer. Hereford fans may remember John as the winger who played in pre-season against West Brom and impressed greatly, so to see him drop to the Blue Square Premier is a surprise. I would like to place on record my views of the issues regarding an unofficial web site and recent statements made on it by its contributors. The site organisers have been warned in the past about libellous, unfounded or offensive accusations concerning members of the Club staff. The Club is fortunate in having a loyal, hardworking staff who have in the past and will continue in the future to do anything necessary to ensure the smooth running, stability and viability of the Club. Anything necessary has meant that there are no demarkation lines in their jobs. They have willingly carried out tasks from, knocking down walls, cleaning toilets or even sitting up half the night inside the ground in order to help the police catch the vandals who have caused us so many problems recently. Their loyalty deserves my loyalty to them; I cannot therefore sit back and do nothing about the outrageous, unfounded and libellous comment that came onto this web site. In my view the organisers must take responsibility and be accountable for what is posted. They provide the vehicle for the comment so therefore must take responsibility to have it monitored. Unfortunately contributors hide behind on non-de-plumes and therefore are not readily traceable. Complaints from me in the past has brought assurances that offensive posting would be removed and offenders banned from the site personally. I do not like the anonymity of the contributors, but providing it is controlled and free from libellous comment I realise that many people gain pleasure from it's use therefore I am prepared to accept it's existence. This weekend an unfounded and libellous statement was posted after our match against Rochdale, it remained on the site for 3 days before our request to have it removed was carried out. I do not accept that for three days the organisers did not know of its existence or its implications. At no time have I ever asked for it to be closed. I cannot or will not have libellous comments posted without me coming to the support of my staff. Because the contributors hide behind anonymity the only people that I can hold responsible are the organisers, that is what I have done. If someone can suggest to me a better way of protecting my staff then I would like to hear it. There is no doubt in my mind that there is a subversive element albeit a very small element that are intent on destabilising the Club otherwise why a desire to get our sponsors involved. At a time when the Club is financially viable has the prospect of exciting development plans, has regained League status and is respected by a great many other Clubs for its organisation. Hence Watford's willingness to loan out two of its bright young stars. Plus the team has started the season well playing some very good football leads me to suspect there maybe hidden agendas to the website issue. I have had a couple of sleepless nights over the problem and may have a few more before it is all settled, however nothing will deter or detract me from remaining loyal to my valued staff if that means we lose a few supporters then so be it. I will not sit back and allow their good names and reputation be dragged through the mud. If anyone can suggest a better way for supporting my staff I would like to hear it. I would be quite willing to meet with the contributors to the site, perhaps in Legends one evening for a full and frank discussion on two conditions, that there is an independent Chairperson and that contributors register at the door with their full name and contributors pen name and that they tell us who they are before asking a question. Conference chief John Moules, much deried by fans, has stepped down from his position with immediate effect citing location issues. Brian Lee, Chairman of The Football Conference said: "We are extremely grateful to John for his many years of loyal service. We fully understand his ties with the South-East which make relocation to Birmingham impractical and in view of the fact that we now have two major long-term commercial agreements in place the marketing opportunities for the Competition, for which John assumed responsibility, will be limited. We have parted on the best of terms and we wish John every success for the future." John Moules added: "I have thoroughly enjoyed all my years at the helm of the administration of The Football Conference and although I am sad to go I feel that I am leaving the Competition in its healthiest ever state both from commercial and footballing perspectives. I have realised that it is simply not possible for me to serve the best interests of The Conference unless I can be at the heart of things in The Midlands and that is not possible for me. "Having played a significant role in the delivery of both Setanta and Blue Square I believe that it is time for me to move on and seek new challenges. The Football Conference has been my life for many years and it is now time to focus on my own family and future. I am grateful to The Conference for the opportunities it has afforded me and am sure that it will go from strength to strength." BBC Hereford and Worcester are lining up a story on the Martin Watson life-time ban from Edgar Street imposed on him by chairman Graham Turner. They have already spoken to two well-respected Hereford United supporters and are hoping to speak to Turner to allow him to put his side of the story and to balance the output. The item is expected to be aired on Drive Time which commences at 4pm. Any supporters wishing to comment can do so by telephoning H&W on 08453008181. Meanwhile the FSF, Football Supporters Federation, are taking up Watson's case. Their chairman Malcolm Clarke has called senior people at the FA and the Football League about this ban. UPDATE 11am: Clarke is lined up to be interviewed for H&W. Martin Watson Petition passes 500 signatures. Paul Parry has withdrawn from the Welsh squad for personal reasons according to press reports. Wales are due to play two Euro 2008 qualifiers against Germany and Slovakia next month. It is believed that Parry left Ninian Park very quickly after last night's game against Leyton Orient. Former Hereford United captain Tamika Mkandawire, now known as Supermac, seems to have settled well at his new club, Leyton Orient. The O's are looking for their fourth League win of the season on Saturday when they are matched against Northampton Town. They have only conceded one goal to date with Mkandawire said to be 'outstanding'. "As a defender you want to keep as many clean sheets as you can, so it's great that we have kept a couple already this year," Mkandawire told the Newham Recorder. "We're looking quite tight as a unit and, hopefully, as the games go on, the understanding between us will get even better. "I don't think we could have asked for anything more from the start of the season. "We just wanted to be up there as quickly as we could, so nine points out of nine means our confidence is pretty high at the moment." This article comes from Twohundredpercent. For as long as football has been played, the running of clubs has been a political issue. Right the way back to the nineteenth century and the division of the game into amateurs and professionals, via Billy Meredith and "The Outcasts FC", Jimmy Hill and the abolition of the maximum wage, right the way up to the Glazer take-over of Manchester United and Michel Platini's attempts the liberalise the Champions League, football runs hand in hand with political machinations, and one of the ways that this manifests itself is through freedom of speech and manipulation of the media. At the top level, this can be seen in the behaviour of the G14, whose marketing talk of being for the good of the game is in sharp contrast with the reality of their raison d'etre. Lower down the game, though, it is such things as freedom of speech over the internet that vex club owners, and this week has seen another club take ludicrously draconian measures in order to ensure that dissenting views are kept to an absolute minimum. I don't think that there's any argument that Martin Watson is a genuine supporter of League Two club Hereford United. He lives yards from their Edgar Street stadium, and is currently the administrator of a Hereford United independent supporters forum. He was, I think it's fair to say, somewhat surprised to receive a telephone call from Hereford United's manager and owner, Graham Turner, yesterday, to instruct him that, as the result of a message posted on his forum over the weekend, he was now banned for life from Edgar Street. It's important to clarify at this point that this was not the result of comments that Mr Watson had made himself - these were comments made by somebody else, questioning whether the reported attendance at the ground on Saturday was genuine. It would appear, however, that Turner is holding Watson fully responsible for the comments that were posted, and he has paid the ultimate sacrifice. As something of a peace offering, Watson has agreed to close his forum by midnight tonight (Wednesday) and, in an even more bizarre decision, the moderators of the the club's official forum have decided to close that as well. A petition has been started with the intention of getting this decision revoked (squint very closely and you'll see my name on it) but, for now, one can only hope that a campaign of negative publicity and appealing to Mr Turner's better nature will have the desired effect. The anonymous nature of internet forums makes this sort of thing a danger. People make ill thought out comments with the cloak of anonymity to cover them all the time (you'll see it every once in a while on here - the more provocative comments are by posted by anyone with enough bravery to actually identify themselves) and, legally, the administrator of a site has the legal responsibility for ensuring that nothing libellous is posted. The comments posted on this particular may not have been been libellous (I didn't see the original post and, obviously, I wasn't at Edgar Street for the match to be able to comment), but it should be perfectly evident to anyone reading this that this is a complete over-reaction from a man who, by all accounts, fears information technology and the empowerment that it brings people. The conventional wisdom of such a situation is that, if something is posted in a forum that causes such an agreement, the administrator of the forum should be contacted in private and requested to remove the offending comment. It's difficult to see what good can come of this decision but the fact of the matter is that, as the chairman and manager of the Hereford United, Graham Turner has complete control and can run the club exactly as he wants to. The club will earn a considerable amount of column inches for such a short-sighted decision and, on top of this, such a state of affairs may lead to opening up old divisions and creating disharmony within a club that has a decent chance of getting promoted this season. That said, this is a by-product of a system that encourages one person to take complete control of a club. One would hope that Hereford's supporters will take note of the support that they are receiving for their nascent protest and continue the good work. Hereford United supporters should be today celebrating the on field performance of the Bulls at Birmingham last evening but instead events concerning the life-ban of Martin Watson and the closure of forums has taken center-stage. It is difficult for this website to present a balanced report on what's gone on because there has been nothing official from the club. Watson's ban was made public on the Independent Forum as around two thousand Bulls supporters were on their way to St Andrews. His statement, a copy of which was printed on here earlier, details the reasons he says he has been banned by Graham Turner. Perhaps not surprisingly there has been nothing from the club. However Farmer's statement doesn't reveal if the moderators had asked other supporters for help in running the Official Forum. Quite why they chose today to close is also difficult to comprehend. So the two main forums that have served, or failed to serve depending on one's point of view, Hereford United supporters are to close. Whatever their faults there have been many constructive and informative posts that have been appreciated by readers. And they have been a way for individual fans to give an opinion on virtually any matter. What are we left with - the Official Website, vastly improved over the last few months and now worth a regular visit, Bulls News which can and does cover a wider range of subjects and will continue to do so, and a new independent forum which, as far as is known at present, will be moderated by persons not resident in the UK. The administrators of the official fans forum have taken the decision to close the Official Forum after 11 years of continual existence. Taking certain recent events into account, and with ongoing work on the official site increasing, the forum administrators no longer feel that they have the time to moderate the forum effectively, and as a result the forum will be closed with immediate effect. The moderators have also taken into account certain personal abuse aimed both directly, and indirectly at them, something which they feel is neither acceptable or fair. They have no wish to endure further abuse into the future. We state very clearly that this decision has not been made by Hereford United Football Club or by any employee of HUFC, but by the moderators themselves who have increasingly less time to moderate a forum that is requiring increasingly more man hours. We would like to thank all of the contributors to the forum over the last 11 years, we have journeyed together through both rough and smooth times, and we have come out the stronger for it. We have made many lasting friendships through the official forum and we are very sad that a few people have ruined it for the many. The Official Hereford United FC Website will continue as per normal, supplying fans with up to date and independently sourced news, interviews, match reports and much more. A petition has been launched in support of Martin Watson, who received a life-time ban from Edgar Street yesterday. To sign the appeal please: click here. Today I, Martin Watson, received a phone call from Graham Turner, manager and chairman of Hereford United Football Club. The phone call related to a post on the forum made by the user Loveibull on Saturday evening, regarding the announced gate for Saturday's match. Mr Turner holds myself responsible for the content of the post and, effective immediately, I have been banned from Edgar Street for life. The post was not made by me, nor pointed out to me, prior to the phone call but I am expected by the football club to be wholly responsible for it despite the fact that, to the best of my knowledge, I have never met the person that actually made the post. Therefore I have no choice but to close this forum. This forum will close at midnight on Wednesday night in order for supporters to arrange an alternative forum for themselves, should someone wish to take the responsibility. The post in question has been removed as per the accepted UK legal precedent known commonly as 'notice and takedown'. I would like, at this stage, to confirm once again that neither Chris Powis (ExLandlord) nor Graham Goodwin (Organic Bull) or any of their family members have any involvement in the ownership or control of this forum. It is a seperate entity to the Bulls News site that we all contribute to. Chris, a 50 year veteran of Edgar Street, and Graham have done fundraising work over the last 12 months for the club and I would hate them to be dragged into a situation that they have had no involvement in whatsoever, as has been suggested by Mr Turner. Prior to today's events I had been a season ticket holder at Edgar Street since 1984, a member of the Vice Presidents' Club since my father's death in 1993 and, for ten years, an unpaid committee member of the Hereford United Vice Presidents' Club - eight of them as Secretary. I had provided numerous IT services to the club, in my professional capacity, free of charge including equipment during the club's tougher times and also assisted in the supply of inflatables to the Open Day in order to raise money for the club where previously the inflatables had usually lost money. None of these thousands of hours of voluntary work appear to count for anything anymore. I wish to request that any supporters who feels that the actions taken by Graham Turner are unfair to please make their feelings known to him or the local press. You can email the club at hufc1939@hotmail.com, telephone the club on 01432 276666 (10am-4pm), or write to Mr Graham Turner, Hereford United Football Club, Edgar Street, Hereford, HR4 9JU. The Hereford Times can be reached at htsport@midlands.newsquest.co.uk, and BBC Hereford and Worcester can be reached at hereford@bbc.co.uk. I repectfully request that you please keep all correspondence civil. I can be contacted on hufcforum@hotmail.com. Many supporters will be saddened that one of our contributers, Bobo (Martin Watson), has been banned for life from Edgar Street by Hereford United chairman Graham Turner after a thread about the attendance at last Saturday's home game appeared on the Hereford United Independent Forum of which he is a moderator. It is understood that the Forum will close tonight. Saturday 1st September '07 Kick-off 3.00 pm. How pleasant it is to make the trip to the Goatcourse at a proper football time of day instead of having to haul ourselves out of bed early to get there for a twelve-noon start. In the region of 600 Hereford fans travelled last season and a similar number are expected to take their seats in "North Wales Premier Sporting Venue" on Saturday. Visiting fans are housed in the upper tier of the Roberts Builders Stand which is all seated and provides an excellent view of the game. The Goats Official Site quotes admission prices as follows.. Concessions include young persons between the ages of 16 and 22 (on 1st August 07) although proof of age is required. Payment is by cash only at the turnstiles. Directions: - A49 north towards Slopbury. At the Baileys Garden Centre roundabout take the A5 sign Oswestry. As you approach Oswestry, stay on the A5 following signs for Wrexham. From Ruabon the road becomes the A483. Stay on this road, as it is also the Wrexham by-pass. Continue until you reach the Mold (A541) junction. Follow signs for Wrexham Town Centre and the Football Stadium will become visible after some 300 yards. Parking is mainly in the streets although I understand the local school/college is also available. Distance is about 80 miles. Postcode LL11 2AH. Standard return fare is £21.10 although saver/group tickets may be available. Wrexham General station is right next to the ground. FUNBUS Departs The Street at 11.00 am Contact Young Ben. Wrexham is reputed to have the highest Pubs to population ratio in the UK! Nearest is probably the "Plas Coch" which is on the nearby Retail Park just passed Homebase. Also fairly close to the ground is "The Walnut", which is in Crispin Lane behind the home end. Walking towards the Town Centre you will find a Wetherspoons outlet called "The Elihu Yale" in Regent Street. A little further on is the "Horse & Jockey", a thatched pub with a decent offering of real ale and good food. "We are pleased to get through. In the first half I was delighted with how we played. After the break we didn't do things properly and got sloppy. "In football, if you think it is going to be easy you can get your backside kicked - and we nearly did. We owe a lot to our keeper. "He made three or four really good saves and he is the big plus point of the night for me. "We saw him last season in Sweden playing for FC Hammarby and we watched him play for Ghana last week. He is a very good keeper. "He can be proud of his debut and he has given me a selection problem which is a nice situation for a manager to have. "I have seen lots of lower division teams just get the ball and lump it up the pitch. plays football in the right way. "His team played with no fear and they have some lively individuals. They made it into a bit of a cup tie. We didn't want that but all credit to them. ""But you also have to give credit to Hereford. Maybe it's because the manager, Graham Turner, is also the chairman and he can't sack himself, but they played without fear, took the game to us and made a real cup tie of it." Bulls boss Graham Turner said: "We can take a lot of pride from tonight but we don't want to be good losers and ultimately that is what we were on this occasion. We didn't play well in the first half. We allowed them too much space and they dictated things. "In the second half we had a bit of extra belief, passed the ball well and created some good chances. Their keeper made some outstanding saves. "It was an encouraging performance. I was pleased we didn't let ourselves down. Now we have to make sure this was not a one-off and continue it on in our league programme." The stats show a very even game with thirteen shots for each side, Hereford had nine on target and Birmingham seven. Dean Beckwith received a top mark of eight, whilst Broadhurst and Robinson were given a seven. The other Hereford players received a five or a six. For Birmingham goalkeeper Kingson was awarded an eight. All the other players a five or six. A word about the man in the middle, Martin Atkinson. He is a premiership referee and it showed. Although he booked both Robinson and Broadhurst for unsporting behaviour, in general he let the game flow with very few hold-ups. A real contrast to the referees last Saturday and the Saturday before at Hereford and Barnet. Hereford United put up a spirited display at St. Andrews this evening, but fell to a 2-1 defeat at the hands of Birmingham City. First half strikes from Garry O'Connor and Gary McSheffrey had handed the home side a decent advantage at the break, but Theo Robinson's goal assured a nervy end for the Premiership team but they held on to progress to the third round of the Carling Cup. For the fourth game running, the United line-up remained unchanged; despite the doubts over Karl Broadhurst's fitness, the ex Bournemouth man took his place alongside Dean Beckwith at the back. The subs bench was once again altered slightly with Simon Johnson replacing Luke Webb. Birmingham named a host of well known players in their starting eleven, including former Aston Villa centre back Liam Ridgewell, and Scotland international O'Conner. Ben Smith's first minute mis-timed tackle allowed McSheffrey to try his luck from a free-kick but it was deflected over. A few minutes after, Wayne Brown was called into action after Rowan Vine struck a powerful drive. Despite the early chances, Birmingham didn't look like creating too much despite most of the possesion, that was until the 27th minute when the deadlock was broken. Matthew Sadler found room down the left hand side and produced a killer cross for O'Conner who volleyed past Brown from inside the area. From the away end, the marking looked slightly shabby with O'Conner being allowed plenty of time to pick his spot, although there may have been calls for offside. Birmingham continued to threaten after their opener, and McSheffrey again went close with a low drive, but Brown was equal to it. The former Coventry winger had been denied on two occasions already, but it was third time lucky for him as he doubled the home side's advantage in the 38th minute. McSheffrey had Vine to thank, as his strong run into the box and pass found McSheffrey who struck powerfully towards goal. Brown got his hand to it, but the power was too much for him and the ball trickled over the line. The goal woke United up, with Robinson making a 60 yard run before squaring to Richard Rose, but the full back's low effort was gathered up by Birmingham goalkeeper Richard Kingson. Just before half time, a free-kick by Rose was headed on, and Robinson flicked towards goal, but his effort was blocked and then cleared. The second half was a different story to the first, Birmingham dominated the opening period, but United really upped their game in the second. Toumani Diagouraga was unlucky just minutes after the half started, as he found space just outside the box and sent a low shot just past Kingson's post. Lionel Ainsworth made a burst down the right hand side, and played the ball to the impressive Robinson, who struck a shot; Kingson managed to palm the ball away, and a follow up effort by Ainsworth was then blocked. Birmingham then came back at United and former Arsenal trainee Sebastian Larsson was superbly denied by Brown, after the Swede's curling free-kick. Graham Turner then made a bold decision to bring on Steve Guinan and Kris Taylor for Trevor Benjamin and Ben Smith, and the changes made a big difference. Guinan's ability to hold the ball up allowed him to feed the ball out to other players, and create chances for others. Good link-up work with Robinson allowed the Watford loanee to get a shot in on goal, but Kingson gathered the ball up with ease. At the other end, McSheffrey fired over the bar from the edge of the area, before Hereford pulled a goal back. Guinan was again involved collecting the ball just inside the Birmingham half, before placing ball through for Clint Easton to run on, who, from the right hand side cut-back for Robinson. The striker took his shot early, and powerfully and blasted past Kingson into the back of the net to send the away support into delight. Immediaetly after, Sone Aluko, an attack minded winger was bought on for Birmingham in place of Mehdi Nafti. But it was still Hereford who looked more threatening, and Easton again crossed, this time for Rose, after a decent counter-attack, but Rose headed over. The best chance for the equaliser fell to subsistute Taylor, after good work from Robinson. 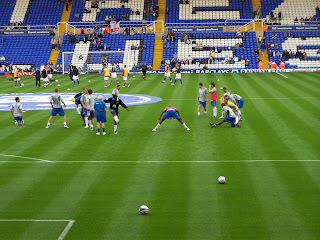 He was found by Diagouraga, and he struck a low shot which Kingson could only push away, Taylor followed up and his first close range effort was superbly blocked by the goalkeeper, before the ball looped up in the air, and Taylor again tried his luck with a volley which went across the face of the goal and out for a throw in. McSheffrey again threatened to put the game beyond doubt, with another fierce left foot drive which went over, before Taylor tried his luck with a full volley after a good tackle, but the ball went wide. The last of the action came when Neil Danns acroabtically tried his luck from a Larsson cross, but the ex Colchester star couldn't find the target. Hereford tried their best to create more chances, but the time was soon up, and Birmingham progressed with a very narrow win. The game, watched by 10,185 including a fine away following, was an entertaining encounter for both sets of supporters. Birmingham, as can be expected, looked the better side, moving the ball around quicker and creating more chances in the first half, but once Hereford found their feet and gained a little confidence, matched the home side in every department, with Robinson up front particulary impressing. Next up for United is another short away trip, this time at Wrexham on Saturday. The Red Dragons were comprehensivally beaten by Aston Villa tonight at The Racecourse, and if Hereford can find their form, then a good result there is a real possibility. There could well be changes too, with Guinan pushing Benjamin for that role up front alongside young Robinson, and Taylor too looking to make the central midfield postion his own. Hereford: Brown, McClenahan, Rose, Beckwith, Broadhurst, Ainsworth, Easton, Diagouraga, Smith, Benjamin, Robinson. Subs: Ingham, McCombe, Taylor, Johnson, Guinan. Birmingham: Kingson, Parnaby, Kelly, Ridgewell, Sadley, Larsson, McSheffrey, Nafti, Danns, Vine, O'Conner. Subs: Doyle, Jaidi, Aluko, Jerome, Forssell. See, I said we couldn't lose! Simon Wright reviews the evening events at St Andrews. Tonight, Hereford tried their best against an expensive-looking lot of Bluenoses. Although there was often an element of little brother swinging wildly at thin air while big brother kept out of range, the Fourth Division sides passing was at times sweet. Blues were frankly lazy in the second half and perhaps were slightly fortunate to avoid extra time. It's a curiosity of modern day Cup football that home supporters pour out ten minutes before the final whistle with the outcome still in doubt. They were convinced the game was won and didn't consider that their side was worth applauding at the end. Meanwhile, the "losing" team received a generous and prolonged standing ovation. The lack of open turnstiles to deal with visiting supporters. Blues must have known how many were travelling. Being "asked" to turn out my pockets by a steward. I did object, albeit fairly feebly. I've not experienced that since Stamford Bridge in the 1980's. The size of the Bluenose "choir" in the Second Half. They were gathering like moths around a light bulb for the crack and.. The noise levels were higher than I imagined though that was from a seat in the middle of the away end. The other goal looked very quiet. That Birmingham City players barely bothered to celebrate their goals. It was something of a throwback to the days of Stanley Matthews and "top hole, old chap." Lionel Ainsworth - First time I'd seen him in action and my, I'm very impressed. Just the sort of quick and direct crowd pleaser Edgar Street needs. Slightly silly first name but you can't have everything. The generally hands-off approach of club stewarding. They are normally, shall I say, more in your face, tense and nervous looking for a reaction. The affable nature of Herefordians. Always such good company and marvelous to see so many at an away game. The £3.50 programme – another money-making stunt from the Bluenoses. Being home by ten past ten – though it was most welcome. And finally, before the kick-off…..
….this entertaining little ditty today appears in the editorial section of the BCFC website, Singing The Blues. Penned by Dax Deakin, the article is titled “Mrs Pot, can I introduce you to Mr Kettle”. My ribs hurt! It's taken me a while to stop laughing. And anybody who read Brady's piece in the Sun on Friday will understand why. Is this woman for real? Can she seriously accuse Hereford of being small minded over ticket prices for next Tuesdays cup tie? For the benefit of those who haven't read it, she is having a whinge over the price of tickets that Hereford want us to charge, saying that THEY want to overcharge supporters. Is this the same woman who adds £1.50 to each away ticket that loyal Blues fans have to pay in order to travel the country to support their team? (£39.50 for Derby tickets.) Pot, Kettle and Black spring to mind. She really is a piece of work that woman. One line in her article does give me hope though…. And I quote…. "With such small minded people working in our beautiful game, I contemplate if it is time to get out of the business….." Karren PLEASE, do us all a favour and get out of the business! I find it incredible that you fail to see that YOU are amongst the small minded folk in the game crippling loyal fans with your add-ons and sky high prices. Ask yourself why season ticket sales at Blues are so disgracefully low. Ask yourself why we have failed to sell out our ground for such a long time. I'll answer for you shall I? Prices! Pure and simple. I know many of you will say it's the poor brand of football we play but I disagree. We've never been a good side yet history will tell you we used to have one of the most loyal set of supporters in the game. Now a vast number of Bluenoses are filled with disillusionment at being ripped of by you time and time again. If you do leave I'll buy you a mirror as a leaving present, obviously there aren't any in your house. If there were, surely you would have had a good hard look at yourself by now. The Football League has confirmed that there has been a change of referee for tonight's Carling Cup encounter with Birmingham City at St. Andrews. Barry Knight was originally in place to ref the game but due to injury, Knight has been forced to withdraw. He has been replaced by Martin Atkinson, who has plenty of Premiership experience over the past few years, including Liverpool's narrow home defeat to Man Utd last season, and the Community Shield in 2006. Barnet midfielder Michael Leary will miss two months after suffering knee ligament damage. The Bees already have a number of injury casualties, and signed three players at the weekend. Ex-Bulls Chris Hargreaves and Mark Beesley, with two, were both on target in yesterday's match between Forest Green and Torquay. Brentford provide an interesting insight into their budget for the coming season. Writing in their match programme, MD Keith Dickens reveals that their playing budget is just over £1million with a £500,000 loss budgeted for the season. The League Two team of the week features two each from Morecambe and Chester, and three MK Dons players. BBC Hereford and Worcester will be at St Andrews this evening for the Carling Cup game between Birmingham City and Hereford United. There will be the usual preview and first half updates before the station commences full second half commentary at about 8.45pm. Whilst the game will be on all the H&W frequencies it is not expected to be available on the internet because of broadcasting restrictions. Keith Hall will be their reporter at the game. Supporters may be able to listen to the whole game if they log onto the Birmingham City Official Site and select the 99p trial option. Hereford United travel to Birmingham later today for what is expected to be one of the best supported away game for many years other than the Conference play-off final at Leicester one year last spring. Games at near neighbours Shrewsbury usually bring out the away support and, when in the Conference, Hereford once had more fans at Forest Green than home support, but this evening will surpass those numbers. Around twenty coaches are believed to be travelling. Any supporter who hasn't booked a seat on a coach could try contacting either HUISA at Hereford United on 01432 276666 or HUMADS for Reg on 01684 572945. No doubt one or two who have booked seats may be unable to travel so a couple of spare seats are probable even at this late stage. With a fair proportion of Bulls support travelling by coach to St Andrews, there will be less pressure on the surrounding area for car parking for those driving to the game. This evening is a good opportuntity to follow the Bulls at a Premiership stadium not too far from Hereford. The team is unbeaten so far this season and, particularily against Yeovil in the first round of the Carling Cup, have played some very entertaining football. This evening won't be easy but the more support the Bulls have, the possibility of a cup shock is just a little more likely. Tickets for the game will be on sale at St Andrews priced just £10 for adults and £5 for concessions. Support the Bulls at Birmingham this evening. Help make it a performance to remember. Below is a reminder of the travel details as written by Ex-Landlord and published by Bulls News last Friday. The Blues Carling Cup Travel. Tuesday 28th August Kick-off 7.45 pm. The St Andrews ground has changed dramatically over the last decade. Gone are old traditional terraces and side stands to be replaced by an 30,000 all-seater facility that has seen three-quarters of the stadium re-built. All that remains is the Main Stand, which was built in 1952. Visiting fans are accommodated in part of the lower tier of the Railway End Stand, which provides for up to 4500 supporters. The views from this stand are pretty good and the facilities include both food and alcohol outlets. It is worth bearing mind that a certain section of Birmingham fans are particularly passionate about their club and this can make for an intimidating atmosphere for away supporters. I would advise as a precaution to keep your club colours covered around the ground or in the city centre. The crowd when on form can still give a great rendition of the Blues anthem "Keep Right On To The End Of The Road". By Car: - From Worcester, use the M5 then join the M42 at J4a. Leave the M42 at J3 (sign Birmingham South) and join the A435. Follow all signs for Birmingham (A435) through Yardley Wood and Kings Heath and onto Alcester Road South. At Haden Circus (Jct 1) roundabout take the 2nd exit onto Highgate Middleway - A4540 (signposted Ring Road, Birmingham Airport). At Camp Hill Circus (Jct 19) roundabout take the 2nd exit onto Bordesley Middleway - A4540 (signposted Ring Road, A38M, M6). At Bordesley Circus (Jct 18) roundabout take the 3rd exit onto Coventry Road - B4128 (signposted Small Heath, Bordesley). After just under half a mile, turn left into Tilton Road and then left again onto Garrison Lane. St. Andrews is clearly visible from the Coventry Road. There is a small car park directly outside the entrance to the away end, but availability of space for cars is determined by how many away coaches are expected as they park in the same car park. Coach and minibus drivers are advised to make arrangements for parking by contacting the club before travelling. There is plenty of street parking around the ground but beware of the "mind your car mate" lads who will be out in strength. Best advice is to offer to tip them a few quid after the game rather than paying beforehand so they can simply vanish with your money. There are also some local schools and businesses that offer parking facilities for around £4-£5. Train: - Looks to be out of the question for those in and around Hereford as the last train back with connection through to Hereford leaves 30 minutes before the end of the game (even without extra time). HUMADS: - Depart Edgar Street 5.00 pm, Cross Keys, Malvern 5.45 pm and Worcester M5 J7 at 6.15 pm. Fare £7.00 contact Reg on 01684 572945. Pubs: - Given the evening kick-off, it is unlikely that much time will be available for pre-match refreshments. One point I would make is an advisability of avoiding those Pubs close to the ground, as Blues fans tend to be fairly protective of their drinking holes. However, for those determined to spend a little time in Birmingham before the game, I recommend the Anchor in Bradford Street (near the Digbeth Coach Station) or The Wellington on Bennetts Hill (just off New Street). Birmingham manager Steve Bruce is taking the Carling Cup game against Hereford United seriously as he says he wants some silverware for the cabinet. "I've always said that I wanted to help this club win a major trophy, something it has not done in its history," said Bruce. "Let's face it, we all know who the top four or five are going to be in the Premier League by the end of the season so the Carling Cup and FA Cup represent the best chance of some silverware for a lot of us. "Of course, it's nice to get the first league win under our belts and we are mindful of the importance of staying in the division. "But we will always treat the cup competitions with the utmost respect and it will be the same against Hereford on Tuesday." Meanwhile Graham Turner has spoken to the Worcester News about the Cup-tie. "Going to Birmingham could be an enjoyable evening providing we put in a performance. We can pass the ball well and I believe that we have enough pace to cause them a few anxious moments. "And if Steve Bruce decides like most top level managers to change things around then it could give us a little opportunity." Former Hereford United winger Paul Parry is back in the Welsh Squad for the forthcoming games against Germany on September 8th in Cardiff and against Slovakia on September 12th in Trnarva. His recall by John Toshack wasn't expected as last week Parry spoke of his uncertainty whether he would ever play again for Wales. "To be honest, I don't think I've had my fair share of opportunities for Wales,” Parry told the Western Mail. "I think John Toshack has got his own squad now, he's got people in his head who he wants to be there, whether I'll be there ever again is hard to say. "I've not been in the last few squads, and he seems to have his ideas now. If those people are fit they seem to be his regulars. "I can't argue with it, it seems to be what he wants to do. I'll let him get on with it and I'll keep playing for my club." The highlights of Saturday's League Two game at Edgar Street where Rochdale were the visitors are now available to watch on Virgin Media. (click league two highlights on the left of this page and select). The picture quality is excellent as is the commentary which is provided by Keith Hall, who also covered the game for BBC Hereford and Worcester. The highlights are somewhat longer than that shown on ITV yesterday. Shrewsbury's ongoing teething problems with their new stadium will see a road closed, and restrictions placed on 41 other roads in the area to protect spectator safety and prevent illegal parking. Notts County are to increase their number of stewards and update crowd safety methods after trouble in their recent friendly with Nottm Forest. Five were arrested after violence between the two sets of fans. Barnet have signed Stev Angus, Kenny Gillet, and Joe O'Cearuill to boost their ailing defence. Stockport have denied interest from Crewe for striker Anthony Elding. Birmingham manager Steve Bruce is said to be considering changes to his starting eleven for the Carling Cup game against Hereford United tomorrow evening. A few of his players who are also internationals have had five games in thirteen days and with a Premiership game next Saturday at Middlesborough he may rest several of them. Reports suggest that Mat Sadler, Neil Danns, Rowan Vine, Olivier Tebily, Colin Doyle and Franck Queudrue may be in contention for a place against the Bulls. Others such as Fabrice Muamba, Gary McSheffrey and Mikael Forssell may be rested. Meanwhile Graham Turner may have to give John McCombe a start if captain Karl Broadhurst hasn't recovered from his knee injury sustained last Saturday. Otherwise the Hereford manager is said to have a fully fit squad to choose from for the game. As reported on Bulls News yesterday, the Hereford United youth team started their season in Puma Youth Alliance with a 3-3 draw at home against Bristol Rovers. Their goalscorers were Tom Smith, Gareth Thomas and Craig Jones. The young Bulls were unlucky not to win the game as Rovers only equalised in the dying minutes. Hopefully all the teams home games will be played at Hereford City Sports Club this season. HUISA travel to Wrexham - Sat Sept 1st. Coaches depart Edgar Street at 11.30. Fare £10. Bookings were being taken prior to yesterday's game and can be made through the club office during the week (01432 276666). Full travel details will appear after Tuesday evening. Among other stories, the Official Birmingham City website is currently carrying two articles that may be of interest to Bulls fans who are already bemused by Karen Brady's recent unjustified outburst. The first story, headed, "Football League dictates Premier League Prices for Carling Cup" is in the news section and claims that they wanted to help their supporters with the cost of tickets lower than the £10/£5 that has been fixed. In complete contradiction, is an article in the "away ticket" section offering the delights of yesterday's visit to Premiership giants Derby County at £38 for adults, £20 for concessions and £15 for juniors. The sting, however, comes with BCFC's own additional booking fee of £1.50 on each ticket. Then, to add insult to substantial financial injury the cost of The Blues official coach travel for the short trip to Derby for non-members is £12 and £10 for juniors (HUISA charge just £8 for the longer trip from Hereford to St Andrews and make a profit). No doubt Ms Brady considers this little outing represented good value despite it costing a total of £26.50 for a seven year old. Giraffe, tin bath etc..
Around two thousand Hereford United supporters are expected to travel to St Andrews on Tuesday for the Carling Cup second round game against Birmingham City. HUISA have filled at least eight coaches and HUMADS had just eight seats remaining on their coaches as at earlier this morning. Hereford United stopped selling tickets for the game last evening. However plenty of tickets will be available on the evening of the game at the ground. Prices are £10 for adults and £5 for concessions. Other than for the Conference play-off final at Leicester in spring 2006, the turnout of support for the Bulls at St Andrews could be one of the highest at an away venue for some seasons. The media attention generated through the ticket price dispute between the two clubs has, undoubtedly, increased interest in the tie by Hereford United supporters. Meanwhile John Trewick, the Hereford United coach, is looking forward to the tie. "It's a great game for us. What sort of side they'll put out I don't know. Quite frankly I'm not bothered," Trewick told BBC Hereford and Worcester. "If we go and play the way we are capable of playing we could cause them a real problem." The bookmakers have released prices for the Carling Cup game on Tuesday. As expected Birmingham are favourites to win the tie with odds as low as 2-9. However up to 9-2 can be found for the game to be drawn and up to 9-1, those odds with either Paddy Power and Stan James, for a Hereford win. A 1-0 win for the Bulls is available at 18-1 with Paddy Power and a 2-1 win is quoted at 25-1 with several bookmakers. A 1-1 draw looks reasonable value at 11-1 with Stan James whilst 2-2 is at 28-1 with the same bookmaker. Should Hereford score first there is a reward of 3-1 at Bet365. Chris Weale and Michael McIndoe helped Bristol City to a 2-1 win over Scunthorpe. They were the only ex-Bulls in the Championship to get a positive result with Cardiff, Stoke, and Watford all losing. Tamika Mkandawire sits on top of League One after Leyton Orient beat Crewe 2-0 to maintain their 100% start to the season. Andy Williams was again a sub as Bristol Rovers won. In League Two, Craig Stanley scored for Morecambe, while Rob Purdie was again deployed as a full back for Darlington. In the Conference, Tim Sills scored the opener as Torquay beat Phil Gulliver's Rushden. Scott Tynan had a quiet day as Craig Mawson had all the work to do at the other end with Ebbsfleet beating Halifax. Andy Ferrell was an unused sub as Kidderminster's season continued its hideous start with a 2-0 home loss to Stevenage. No side has a 100% record after just three games. Darlington head the table, after a 2-2 draw with Notts County, with Chester level on points in second after a comprehensive 4-0 demolition of Dagenham in front of less than 2,000 of their own fans. Shrewsbury and Lincoln are both on six points. The Shrews were thumped 3-0 by MK Dons, while Lincoln beat Accrington 2-0. Rotherham drew 2-2 with Stockport, and Brentford beat Barnet 2-1 in another stormy game for the pair. Both were reduced to ten men just days after getting warned and fined for poor discipline last season. Bradford beat Wrexham 2-1 to record their first win of the season. Grimsby drew with Macclesfield 1-1, both side's third successive league draw, and Morecambe beat Mansfield 3-1. Wycombe beat Bury 1-0, while Peterboro lost again 3-2 to Chesterfield. The number of supporters following Hereford United so far this season has been lower than last year and it has to be hoped that the Carling Cup game at Birmingham next Tuesday will rekindle interest in the Bulls. This afternoon the gate was 2732. And with 257 supporting Rochdale, only 2475 Bulls fans turned out. Last year the equivalent game was against Harlepool and the home support was 2967 out of a 3156 total gate. The drop is nearly 500 which means less income, perhaps as much as £4,000, for the Bulls for just one game. Last Saturday at Barnet, the number of Hereford supporters was given out as 380. Last August at the same fixture there were 538 fans backing the Bulls. And the figures for the Carling Cup game against old adversaries Yeovil weren't very encouraging. Just 1868 home fans watched the game. Last year when Coventry were the visitors some 2747 home fans came through the turnstiles. The first home League Two fixture this season, against Rotherham, was watched by 2893 Bulls fans whereas last season when Lincoln were the visitors some 4159 home supporters were at Edgar Street.It should be noted that the game against Lincoln was the first back in the League for Hereford. The Bulls are 9th in the table and have started reasonable well. Hopefully more supporters will attend the next home game. However as Macclesfield are the visitors it might be not be the most attractive fixture. Hereford United have said they will use this game for season ticket holders to bring someone with them free of charge to watch the match. How much difference that will make remains to be seen. Today's game was spoiled by too many stoppages imposed by referee Graham Horwood. He was quite strict on any sort of physical contact. Any sign of holding and tugging warranted a free kick. In general he was consistant but his actions stopped the flow of the game on too many occasions. At least when he gave Rochdale a penalty he only gave Karl Broadhurst a yellow card. David Perkins of Rochdale received his marching orders after gaining two yellow cards, the second of which came when he obstructed Trent McClenahan. Three other Hereford players were booked, McClenahan, Diagouraga and Wayne Brown. Hereford had eleven goal attempts, six on target. Rochdale had six of which two were on target. And the Bulls won twelve corners against two. But the main stat was for fouls - Hereford 18 and Rochdale 21. Possession was said to be 50/50. Bulls young striker Robinson received an eight for his efforts, as did the 'Dale 'keeper Spence. Every other player received a six or a seven. Hereford United drop to ninth place after today's results. However just two points separate Darlington, the leaders, and the Bulls. Broadhurst could miss Birmingham game. Hereford United captain, Karl Broadhurst, could miss Tuesday's game at Birmingham. He was subbed at half time after receiving a knock. "He's bruised his knee. We are hoping it is nothing more serious than that. The doctor had a look at it and that's what he thinks it is," said Graham Turner in a post match interview. "But he is probably going to be missing on Tuesday in Birmingham." Broadhurst was replaced by John McCombe. Meanwhile the Hereford United Youth team also drew their home game today. Final score against Bristol Rovers was 3-3. Ben Smith has played several Carling Cup games at various grounds for different clubs in his career and is looking forward to Tuesday's round two game against Birmingham City. "I've never had the pleasure there. At my age I never thought I would so it's a great experience for us," Smith told BBC Hereford and Worcester. "The Yeovil result was a great result and a great performance and I think we've earnt the tie. "We deserve to go to St Andrews and enjoy ourselves. I wouldn't imagine they will play their full side so if they do take any liberties then we might be able to take advantage. "Even if we don't it will be great experience for all the younger players like Lionel and Theo and Toumani who have obviously got asperations to play at a higher level and no doubt they will. This will be a good chance to test themselves against better players." Smith said he had read Karren Brady's words about Hereford United and he encourged Hereford supporters to go to the game. "We need all the help we can get! So as many fans as can get there, the support will be much appreciated. "You never know - not many people expected us to beat Yeovil so why not. Speaking to BBC Hereford and Worcester after this afternoon's game John Trewick said it was a very solid performance. "0n another occasion we would have won the game comfortably. We had enough possession, enough chances and caused them a lot of problems. Their keeper has made two or three saves and I felt we were unlucky not to get the three points," said the Hereford United coach. Trewick said he didn't see the penalty decision, which resulted in a yellow card for Broadhurst and a goal for Rochdale, as clear-cut. "I don't think anybody saw it as clear cut. It will be interesting to see what the video shows. I thought it was a very harsh decision and it set the tone for the afternoon. The referee gave some baffling decisions at times." It was pointed out by reporter Keith Hall that it was the referee's third game in the Football League. Trewick said it looked that way at times. Trewick then spoke about Robinson's goal and the fact that the Bulls have a bit of pace at present. "It was a typically quick attack. Lionel got it and played the ball through. Theo run onto it and finished terrifically well. They're crowd pleasers, people who can excite - we want that to happen. We want the crowd to come here and have a bit of a buzz when they get the ball and around the ball. To a large extent that is happening." Hereford United drew for the second time at home after a 1-1 draw with Rochdale. The visitors, pointless before today's encounter, took the lead mid-way through the first half through a Chris Dagnall penalty, but United's Theo Robinson netted his second goal in as many games to equalise soon after. Despite a flurry of chances in the second half, Hereford couldn't find the all important winner, but take a point. The line-up remained unchanged from Barnet last Saturday; Luke Webb however was preferred to Sam Gwynne on the subs bench. Rochdale's side included former Morecambe midfielder David Perkins, and tall striker Glenn Murray, who impressed towards the end of last season for Keith Hill's men. It was Murray who went close early on with a trademark header going over the bar, before Trevor Benjamin's control let him down when in the six yard box after a Ben Smith header. It soon became apparent that the referee was giving the game little chance to flow, and he awarded Rochdale a soft penalty. Karl Broadhurst was the "guilty" party, adjudged to have pulled back Chris Dagnall. The former Tranmere striker stepped up from the spot to send Wayne Brown the wrong way, and likewise Barnet last week, put The Bulls behind. Hereford responded instantly though, with a shot from Robinson tipped away by James Spencer, before a follow up effort from Richard Rose was pushed away for a corner by Spencer once again. An ambitious Murray effort was far over the bar, before just five minutes after the opener for Dale, United equalised. Ainsworth sent a looping ball in behind the Rochdale back-line and Robinson used his pace to gain a yard on the defender. The chance wasn't easy though, but Robinson managed to gain control of the ball before firing powerfully past Spencer into the far corner. The goal lifted Hereford, with Lionel Ainsworth getting involved. A curling free-kick from the ex Derby youngster went inches wide, before a neat flick minutes later set up Robinson, but the loanee couldn't double his tally for the day, as his fierce half volley was deflected over the bar. Just before half time, Trevor Benjamin headed straight at Spencer before Rose nearly struck his second shot of the day, again going close with a 25 yard left foot shot. John McCombe was handed his United debut in place of captain Karl Broadhurst during the break, but the second half offered little compared to the first half, with the heat taking its toll on the players throughout. The Bulls started well, with Clint Easton crossing for Ainsworth to fire a half volley close. The best chance of the half fell to Benjamin; Easton won a header on the edge of the box, and Benjamin used his power to twist and shoot. Rochdale goalie Spencer knew little about the shot though, as it rebounded off his legs and out for a corner. After that the game calmed, with half chances from Toumani Diagouraga and Trent McClenahan failing to trouble Spencer. Steve Guinan and Kris Taylor were introduced in place of Benjamin and Ben Smith, but both failed to make an impact on the game. Rochdale also looked to spice things up with Lee Crooks taking the place of Gary Jones, and Adam Le Fondre coming on for Rory Prendergast. Despite much possesion for United, they failed to muster up any decent opportunities despite Ainsworth looking dangerous. Just before the 90 minutes were up, Rochdale were reduced to ten men, perhaps slightly harshly, when Perkins was booked for the second time after a block on McClenahan. In stoppage time, Ainsworth burst down the right wing, and crossed low, but a scramble at the near post failed to result in a shot, and the ball was cleared. Goalscorer Dagnall was subbed off with Adam Rundle coming on, as Rochdale wasted a few more seconds; soon after, the ref blew his whistle for full time. Rochdale were tipped by quite a few to make a decent impact on the league this season, and the point for United will be viewed by many as a good result. However, looking back, The Bulls will be dissapointed not to have gained all three points as they had by far the better chances, with Dale failing to make an impact on goal in the second period. Watched by 2732 fans, with a total of 257 from Rochdale, the majority of which will be heading off Birmingham in the Carling Cup on Tuesday, before United return to league action against old rivals Wrexham at The Racecourse. Hereford: Brown, McClenahan, Rose, Broadhurst, Beckwith, Ainsworth, Easton, Diagouraga, Smith, Bejamin, Robinson. Subs: Ingham, McCombe, Taylor, Webb, Guinan. Rochdale: Spencer, Ramsden, McArdle, Branson, Kennedy, Doolan, Jones, Perkins, Prendergat, Murray, Dagnall. Subs: Russell, Crooks, Rundle, Muirhead, Le Fondre. Rochdale weathered a second half storm to escape Edgar Street with a point in today's League Two match. Dale opened the scoring from the penalty spot following a debatable decision from referee Graham Horwood, one of many iffy decisions that saw both sets of fans berating the official's performance. Theo Robinson bagged the equaliser after an excellent through ball. The gate of 2,732 included 257 Rochdale fans, a worrying decline in attendance despite good results. One of the owners of Crawley Football Club could be on his way to jail after failing to turn up in person for some community work. This from the Crawley Angus as reported by the very informative Altrincham website. A football club boss faces jail after getting a substitute to carry out his community service. Azwar Majeed, the Porsche-driving owner of Crawley Town Football Club, sent a lackie to carry out the 60 hours of unpaid work he got for an assault. Danny Ullah, 29, one of Majeed's staff, spent his time pottering around gardens and clearing weeds under the eye of probation officers while the football club boss had his feet up. The two men agreed to the con after Majeed, 31, from Dyke Road, Brighton, was sentenced to do the work in June 2005. Faced with the prospect of running his numerous businesses, which include the bar Ja Vu in North Street, Brighton and Ja Ja Bar, Crawley, along with the football club, Majeed and Ullah swapped identities and Majeed gave the court Ullah's address. By the time the deception came to light, Ullah, 29, from Seaview Avenue, Peacehaven, had carried out seven sessions - almost all of the 60 hours of unpaid work. Yesterday at Hove Crown Court both men were warned they faced jail sentences after admitting perverting the course of justice. The court heard Majeed was sentenced to 60 hours community service after he was convicted of common assault in June 2005. The deception was not discovered until September 2005. Jeffrey Lamb, defending Majeed, told the court his client was currently subject to another community service order. Majeed was given 90 hours for punching and smashing the jaw of 18-year-old Martin Grainger outside a chip shop in Worthing in September 2005. He has still to complete 76 hours of the work but the order has been suspended because of injuries he suffered when he crashed his yellow Porsche 911 on the A23 at Pyecombe in January. Judge Cedric Joseph adjourned sentence until September 21. He told the defendants: 'The overwhelming probability is a custodial sentence'. The two men were released on bail. Majeed and his brother Chas have variously hit the headlines for their running of Crawley Town Football Club, which has suffered major financial troubles for the last three seasons. The Majeed brothers were also in hot water after a mass brawl outside Ja Vu bar, then called Saqqara. Police closed the bar and criticised its management shortly afterwards... Azwar Majeed refused to comment. Steve Evans, who was with Boston, is currently manager of Crawley.